This guide is also available in video format. Click on the image below to watch the video or scroll down for the written version. The last thing you might need to buy when starting out is Input materials for your Production Line(s). (“Production Line” is simply another term for one type of building that produces goods, like, for example, the Prefab Plant Mk1. All Prefab Plants Mk1 in a base, be it one or many, will make up one Production Line.) Input materials are commodities that are processed into another commodity in your Production Line. If your first Production Line consists of buildings found in the “Resources” tab, it does not require any Input materials. All buildings in the Pioneers tab, however, do. 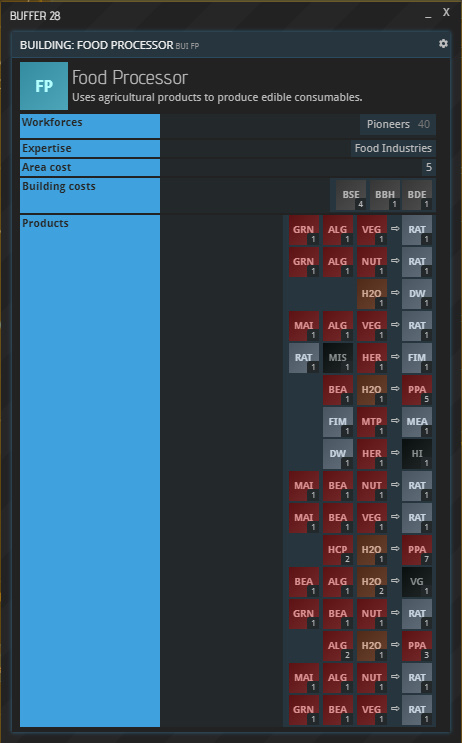 Hit the BUILDINGS (formerly “SECTIONS”) button in your base overview, and click the symbol(s) of your producing building(s). The “Products” section shows which commodities can be produced here and which Input materials, if any, are required for that to happen. Think of each of these lines as a chemical reaction: everything left of the arrow - the input materials - goes in, the product on the right comes out. Later, when the building has been constructed in your base, you will be able to choose which of these reactions you want to happen each time you produce something. Which output should you produce? To make that decision, have a look at the Commodity Exchange and check what people are buying. Is there anything everybody needs right now or that people will need soon? Or maybe some shortage you could profit off? You can also ask around in the public communication channel. Now go ahead and buy whichever Input materials you require for the desired output. It is possible that you do not get all the Input materials you want right now. See which ones are already available, start producing what is possible, and check back soon for anything you might not have gotten. Especially if your section of space has just recently been settled, the market might take a while until more refined commodities become available. The last thing you need to learn now is how to place Production orders. (Do not confuse them with Buy orders and Sell orders made on Commodity Exchanges.) Right now, your workforce is idle and awaiting your commands. Bring up your Production Lines by selecting “Production” in the Base overview. You should see the name(s) of your production building(s) and an array of empty boxes underneath. Those boxes can be filled with orders by selecting “New Order” right above them (or via “Details” - “New Order”). The PRODCO buffer which now opened up lets you choose which commodity you would like to produce. As established, some buildings can only produce one commodity while others offer a wide variety of choices in the dropdown labeled “Primary Output”. You can also see here which Input materials are required for which output. Remember that you may have already decided what to produce earlier, when you bought your input materials. You can always produce one type of commodity per order. Once you selected it, set the Order Size. The higher it gets, the longer the order will need to process and the more input materials will be required. You will find that this is very handy. If, for instance, you know you cannot check back with your company for a while, just set it to a high value, and your workers will not run out of things to do while you are gone. Start processing the order by hitting “QUEUE ORDER”, and it will show up in your Production Lines window. If your workforce is fed and you are not missing any input materials, it is now being processed, and you will be able to track its progress and the time remaining. Send out more orders until your queue is filled up. You can pick a different output material for every order as you desire. Once queued, an order can be canceled by selecting “Details” below your Production Line and then “Cancel” next to the order. Once an order is being processed, it can no longer be canceled. This concludes the tutorials you need to finish in order to get your company off the ground. However, there is still much to learn. Once you have grown more accustomed to APEX and are ready for more, continue with the “Commands” tutorial. This page is part of the introductory tutorial, which encompasses parts 1 and 2 (2.1-2.5). Use the arrows on the sides to cycle through all available tutorials in order, from introductory to more and more specific topics. If you encounter an error or cannot find the answers to your questions, we will gladly help you on our Discord server.